WARNING: Massive spoilers for The Force Awakens below! Do not read until you've seen the film. Star Wars: Episode VII The Force Awakens has been garnering a great deal of much deserved praise these past few weeks. Arguably one of the film's strongest points is its cast. Daisy Ridley, John Boyega, Adam Driver, Oscar Isaac and others have captured the hearts and imaginations of fans everywhere with their outstanding performances. And while all of that praise is warranted, lately I couldn't help but feel that enough wasn't being said about a certain returning character and actor. One that pretty much stole every scene he was in and grounded the film overall. Of course I'm talking about the legendary Harrison Ford and his alter ego Han Solo. 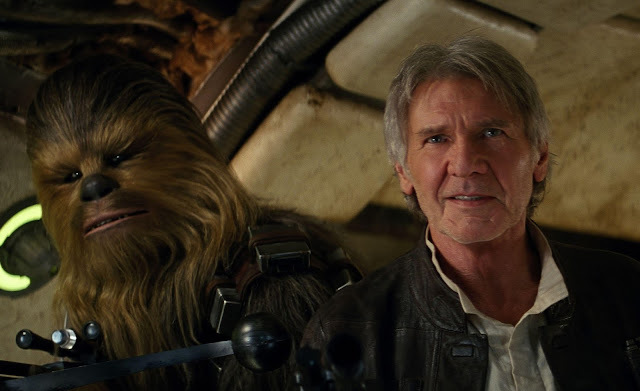 Way back at Star Wars Celebration Anaheim Harrison's delivery of "Chewie, we're home" in the second teaser trailer became an instantly classic and quotable line. The idea of our favorite scruffy looking nerf herder returning in the flesh made fans that much more excited, and in the end his role in the film was one of the biggest highlights. Han was truly the heart of The Force Awakens in many ways. Ford's performance was genuine and sincere and he did a brilliant job of portraying a Han that was very different, but also very much the same which made for a smooth transition into this new era. It was such a joy to see the Wisdom, charm and humor of the character once again brought to life on the big screen for the first time in thirty two years. 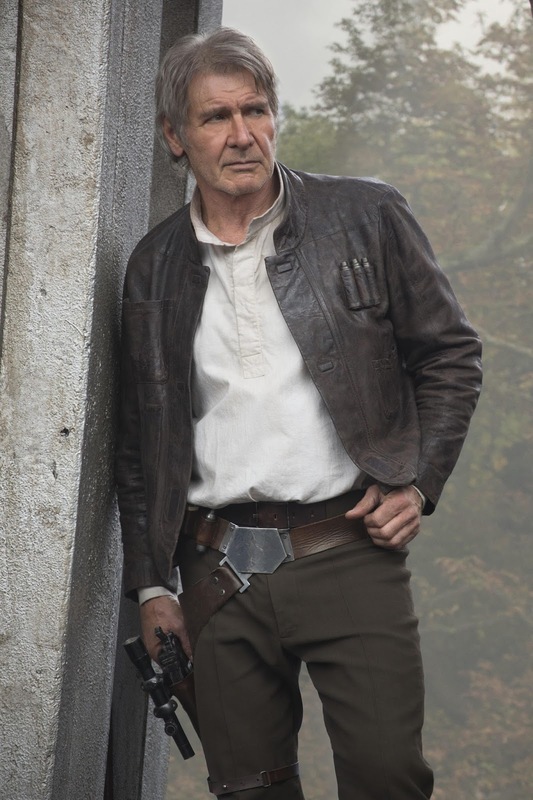 But what was especially striking and bittersweet about Harrison's return as Han was that it would be his final outing as the beloved smuggler. Regardless of the rumors, I think most of us saw his demise coming. Of course, the prospect of Solo dying is an idea that has been around since Return Of The Jedi when Harrison himself suggested the character should be killed off. He felt at the time that, unlike his co-stars, Han didn't have as much of an important role in the saga and sacrificing himself for the greater good would a poignant end for him. Obviously George Lucas decided against it at the time, but writers Lawrence Kasdan and J.J. Abrams decided to revisit the concept in The Force Awakens. Naturally many fans have expressed sadness and anger about Han's death in The Force Awakens, and some have even gone as far as suggesting that his death was meaningless. I beg to differ. I think Han's last moments were his strongest. When we first met this character he was incredibly selfish, only caring about the wellbeing of himself and possibly Chewie. Over the course of the Original Trilogy Han morphed from a self centered pirate into a strong leader and loyal friend. After that we are left to assume he went on to be a caring husband and father. Those traits showed through clearly in this film. His last act was one of absolute compassion and love for his son, paralleling the final moments of Anakin Skywalker saving his son Luke in the previous film. Knowing full well what Ben/Kylo was capable of, he confronted him in hopes of bringing him back to the light. Yes, he ultimately failed to bring his son home, but succeeded for a brief moment to bring out the good in him(Yes, I believe Kylo’s plea for help was sincere) and thus proved that Leia was right, Ben is not completely lost. Now, after all is said and done, it appears Harrison Ford has played Han for the last time in a Star Wars film, and in my opinion, it was his best Star Wars film to date. Now we can look forward to going back in time and seeing Han at the earliest point in his life we've ever seen him in the upcoming Han Solo Anthology film coming in 2018. We are all anxiously looking forward to seeing a brand new actor take on the role and breath even more new life into the character. But in the meantime we must reflect on the impact this character and the actor that portrayed him up until now has made. Rest in peace, Han. And thank you, Harrison. You both will be continued to be cherished for generations to come. Also, I would be remiss if not to mention Peter Mayhew and Joonas Suotamo for their combined performance as Chewbacca in The Force Awakens. Because what's a scoundrel without his Wookiee? He felt like the same old Chewie and had some fantastic moments in the film, especially beside Han. I disagree with one comment in your article. I don't believe it was the same old Chewie. I believe that it was a much more animated Chewie that seemed to have a more substantial role than just "Han's Sidekick". And I truly look at this as a positive. Even though, it was well done. I can't believe how much I flinched, even though I had a feeling "it" was coming. Still, I thank Harrison Ford ( and all of the OG characters ) for taking this role one more time. Great article, I gotta agree with everything... It was a bittersweet moment to see Solo dying, but also, it was the strongest moment on the film, which also happened to save Kylo Ren's character from being just a bad wannabe to a really bad and hated villain. Ford dominated the screen on his scenes, just by being the hero we all love. Spot on.... Thanks for the memories Han. The torch was passed down to the next generation brilliantly. Am I the only one that feels cheated by his death? I can understand the story reasons for his death, but it just felt so cheap! I think they should have stuck to the original idea,& it should have been for the greater good, which a smile of knowing to the others or a quick quip,' good bye old buddy' to Chewy. I now it's clichéd, but the character deserved so much more! I agree 100%. He is a great character and his death to a tantrum chucking Vader fan boy was cheap. In Han's eyes, he was not a "chucking Vader fan boy", he was his boy and he could die for him, as hi did. "Wars does not make someone great" as Yoda said. He didn't need to die in a "heroic" battle. And besides, what Kylo did to his father will haunt him for the rest of his days and surely will have a huge impact on his character development in the next two movies. I will say I think Kylo wasn't conflicted. Kylo's pain was "the light" side pulling him back from the dark. When he asked for Han's help, he was asking for permission to kill him which would be the ultimate betrayal wiping out any feelings of love he would have for his father. After watching the film 5 times I can tell you the color pallet was beautiful. As the light was shinning down from the star cutting across the bridge as if coming from the heavens. When you looked up it was Finn and the true "light" which is Rey. As the sun was absorbed by the Starkiller base it was in that moment when everything went dark. You knew it was coming. Han thought he could bring his son home, but the flinch while holding the light saber said it all. Then as painful as that scene was to watch Han's last act was to reach out and touch Ben's face letting him know that even though he committed this horrible act.....he was still loved by his father. Then Han falls into the "white light" letting the audience who adored that character for 40 years that Han would be ok......going to better place....a cosmic heaven. In one of the best moments of the dare I say any Star Wars film next to "I am your father" in Empire this will go down in history as one of the greatest moments in the Star Wars cinematic universe. Chewbacca enraged and shooting Kylo in the rib cage was one of the best reactions. At that point Chewie had no more "f@%ks" to give and blew everyone and the thermal detonators. It was fitting that Chewbacca according to the "canon" was in a life debt to Han for rescuing him out of slavery was able to try and defend his life long friend. I hope in the coming films Kylo is not able to come back to the "light" and Chewbacca just might have a chance to avenge his old friend. How fitting would it be for Chewie to be the one to end Kylo while Rey takes on Snoke? Goodbye Han, and thank you Harrison for giving your character an amazing send off as sad as it might be. Now....let get on with Episode 8 shall we? Great observations. I too loved Chewie's reaction. It eased the pain of Han's death a little bit. And I agree that it'd be awesome to see Chewie avenge Han. Han Solo was always a scene stealer. If this 'new generation' was to own these films, having Han pass on was necessary. He dominated this film. He was, as was said, the heart of the movie. While I would love to see more Han Solo (and Indiana Jones), his continued existence would have been to the detriment of the development of the new generation...a victim of his own success. Harrison was brilliant, but there were glaring directing/screen-writing problems which I couldn't ignore. Foremost; his entire onscreen time was spent practically setting up his exit, it was like he was saying goodbye in every scene. There was a sorrowful tone there, like a swansong. It bugged me. The second was inconsistencies with the previous movies. Chewbacca has had that crossbow rifle forever, and suddenly Han is treating it like a new toy? Third is the lazy way Solo and Chewbacca were introduced. Could they not have figured out a more imaginative way to bring them back in? I wanted to laugh with surprise, like maybe Solo was hiding in the Falcon, trying smuggling HIMSELF out of Jakku. It would have been much better than simply having him spring onboard shouting "hey look, it's me!" As I say, these complaints are directed at Abrams and the screenwriter, because I believe Ford did a stellar job with what he was given. He was typically the most like-able actor in the whole movie. Those whom have waited 30 years to see, yet again, The Great STAR WARS; I'm sure now are either perplexed, confused or like myself damn right angered by the much loved character in the original trilogy. Yes i'm talking about the hero of the galaxy "Han Solo". Definately shocking but not needed. We just wanted to our hero's all together, as per what the hype & funding to make this movie. I don't know if i blinked or what, but i never saw them all together at all??? WHY? Contrary to the Star Wars Universe who's created foresore many eons ago. We knew that Leia & Han had 3 children, aswell as Luke too. We knew Chewbacca had a sworn to always be by Solo's side from an old "Blood Debt" after Han saved him & he was supposed to fulfill this sacred Wookie oath. Chewie's a very old wookie & has lived a better life than most of his speices. J.J. has is reasons apparently, mean total B.S. cause he has ruined this trilogy. No more will we here those great lines improved by Ford, like the reply to leia's "I love you"
No more will we see him saving the day with or without the iconic Millenium Falcon. No more flirting with his princess, slicing a tauntaun to save his "kid Luke" " and i thought they.....smell bad on the out side", his mad charges at stormtroopers, infact nothing at all?? J.J. could be accused of being ageiest by Disney's low key comment about Harrison Ford may not live for 2 more films. B.S. & B.S. oh and B.S. Conspiracy has also been mentioned with the 1st being "The STAR rivalry" a man who has put his faith in TREK now directing WARS ???? 2nd an employee claims to overheard J.J. in closed meetings with religous leaders mainly Jews & Christians? Worried about the growing "Jedi Faith" one day destroying his own jewish culture and its cousins agrees to ruin the franchise along with Disney. Less American thoughts say "just like yanks to change history" , i agree wouldn't be the 1st time!!! Anyhow its not how it shoud've been and us true fans know it. Come back Lucas cause J.J.'s only chance to save it would be ...A Dallas type dream sequence!! M Sinclair, were you drunk when you wrote all that garbage, or are your thoughts as scattered and incoherent as your bad attempt at using English? None of what you wrote even makes sense.